A Graceful Death is currently 99c for Kindle. It's the first book in the Lowenna series. Giovanna Matthews has an acceptable life in London with her own flat, a good job, and recent engagement to the son of a Scottish landowner. But not long after her engagement to Alan, news of Aunt Grace’s death hits Giovanna like a red double decker bus. Ignoring Alan’s pleas to stay, she bundles her dog and suitcase into a rusty Volkswagen and drives to Aunt Grace’s cottage on the Cornish coast where Giovanna had spent childhood summers with her cousin. Putting her aunt’s affairs in order is further complicated when Giovanna discovers the local constabulary has its own view on Aunt Grace’s demise - A view that Giovanna vows to challenge. Unless she can discover how her aunt died and find her missing cousin quickly, she stands to lose both her inheritance and Alan. 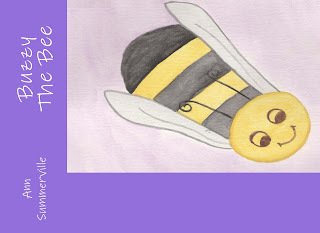 When Joe, the gardener, had to leave for a few weeks, Buzzy and her friends promised to look after his garden – all except Frank, the beetle, who didn’t realize what he was giving up by being lazy and sleeping instead of helping his friends. (Based on the parable of the five talents). Mermaid's Bane - the Fifth book in the Lowenna series - is now available on Amazon. When Flora, one of the ladies in the Lowenna Knitting Circle, dies suddenly it puts everyone on edge. The woman the Circle refers to as The Mouse, surely didn’t have any enemies, but is there more to Flora than meets the eye? And why are women who wear a mermaid pendant suddenly in danger? Gia can never miss an opportunity to uncover a mystery, but she has much more to contend with - her pregnancy, and the possibility of neighboring shops to Lowenna Antiques closing. And then there’s a newcomer who gathers bouquets of flowers – some of which are known to kill! Other cozy mysteries in the Lowenna series: A Graceful DeathHigh TideGwinnel GardensTrouble at the ManorMermaid's Bane - the Fifth book in the Lowenna series - is now available on Amazon. 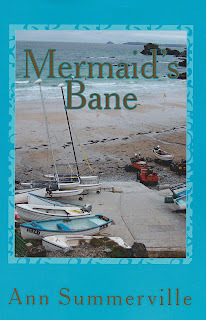 I'm in the final stages of publishing the fifth book in the Lowenna series, Mermaid's Bane, and many people have asked where the Cornish village of Lowenna is located. Although the village is fictitious, memories of several Cornish villages were combined in the descriptions. Aunt Grace's cottage, where Gia and David live, is on the Perranporth cliffs. Down the hill and toward the car park I have placed Lowenna Antiques. For other descriptions, such as the harbor, I used Trevaunance Cove near St. Agnes which is pictured on the blog banner and covers of High Tide and Mermaid's Bane. The King William pub I modeled on The Railway Inn, St. Agnes. By the way, if you are visiting Cornwall I highly recommend accommodations at the Driftwood Spars which is by the cove.